"Great thick sauce on ribs and chicken!" Used this in place of bottled sauce in Freak'n Good Ribs. Everyone just devoured them. Not too hot, not too sweet. Very good sauce. I didn't have cayenne on hand because my family doesn't care for very spicy things, but it tasted just fine without it. 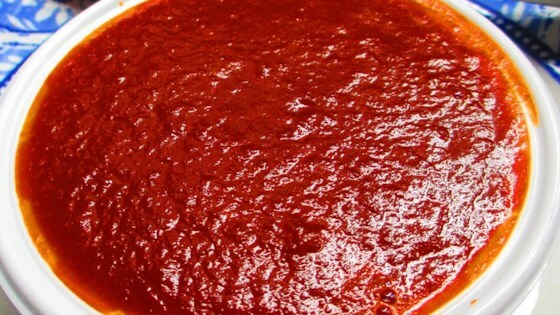 Very good sauce. Sweet when you first taste it and then it kicks! Great to keep in the fridge for summer grilling. This is especially good on ribs that are wrapped in foil and baked slowly with chili pepper(2-2 1/2 hrs at 300).